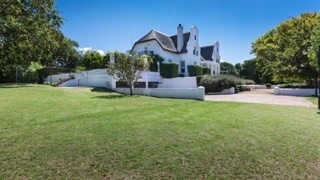 Luxury Portfolio International is proud to present this wonderful home in Constantia Upper, Cape Town, South Africa. Don't miss this chance to own a gracious equestrian homestead! Exterior highlights include established gardens, a floodlit tennis court, and stables for 5 horses. Rest and relax in the ambience of the outdoor pool. The upstairs study opens onto a terrace with breath-taking views of the surrounding vineyards and mountains. You'll find 5 bedrooms and 4 full baths in this home. This property is listed by Jawitz Properties Ltd., a member of Luxury Portfolio International.